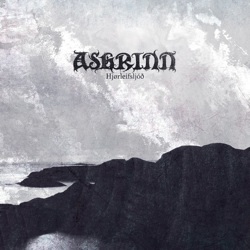 French pagan black metal band Askrinn has recently released its amazing debut full-length album entitled “Hjørleifsljóð“. Askrinn (“The Ashtree” in Old Norse) is the personal project of Valenten, formed around 2011. His music is clearly influenced by Nordic pagan black metal, with the intention to evoke ancient Runic esotericism and forgotten Nordic lore. After the single “Fé Vældr Frænda Róge” in 2013, Askrinn worked on their debut album, which was finally self-released on November 14th, 2014. Except for a good musician, Valenten is also a huge metal fan who supports the black metal scene, be it mainstream or underground. He has written some very interesting articles that you can read in the band’s official page. I actually see his first album as a tribute to the Nordic pagan black metal scene that he obviously adores and to the bands that influenced and inspired him. “Hjørleifsljóð“ includes 4 new tracks, plus a cover on “Hymn to the Forgotten Pagan Gods” of the Hungarian pagan black metallers Bornholm. The total album duration (including the cover) is 34 minutes, so it’s something between an EP and full-length. The concept of the album is based on the authentic 14th century Icelandic saga “Hálfssaga” and its lyrics are written in Old Norse, dealing with King Hjørleif’s life. Askrinn’s music has an underground sound aesthetic, where raw black metal meets the melodic nature of pagan metal and the melancholia of French black metal: the perfect marriage of somber, nostalgic epic melodies with the pure “evil” atmosphere of old school black metal. Wonderful distorted guitars, changing from rhythmic riffs to melodic leads, accompanied by natural sounding drums and howling screams, create a really beautiful epic, atmospheric and haunting result! No synths needed here. Valenten managed to combine all his influences creating a very interesting sound, adding at the same time his personal stigma to the music. Favorite track for me is the brilliant “Frá Konungum, Hjörleifi ok Hreiðari” one of the best black metal songs I’ve listened to recently! Congratulations! The production is perfect for this genre, but I am sure we can expect even better things in the future from the band. This French black metal band was a great discovery for me last year, and I hope they continue this way. Except for its digital version, “Hjørleifsljóð” is also self-released in a standard jewel-case CD edition, limited to 60 copies, with a 4-page booklet, including all the lyrics. If you are interested into quality pagan black metal, you better visit Askrinn’s official pages, where you can download the album for free, or purchase one of the few remaining CD copies. The trailer below can give you a first taste of their music. Thank you so much for this great review !! Very much appreciated – I will share it today !